Did you know that the first Indian in the United States is said to have been a man from Madras who visited Salem, Massachusetts in 1790? Long before the major thrust of Indian immigration to the U.S. began in 1965, Indians were trickling into the United States as merchants, adventurers and seafarers in the late eighteenth and early nineteenth centuries. Between 1904 and 1920, more than 7,000 Punjabis, mostly Sikhs, came as sojourners to the Pacific Northwest to work the lumber mills and the railroads. They eventually settled down in California and built successful farming communities. During this time, many Indians also came to the United States as students and political refugees who had been active in the movement to drive the British out of India. Among the famous Indian luminaries who visited the United States in the early days were Swami Vivekananda and Rabindranath Tagore. 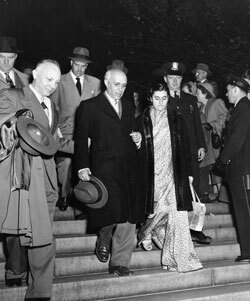 Enjoy this online exhibit by the National Indo-American Museum anytime!